Two periods of seven days including the spring or autumn equinox are called Higan(彼岸), which means "the other shore" or Buddhahood. Higan went from September 20th to 26th this autumn. We visit our family graves to pray and make offerings of flowers and incense during Higan. I went to my family grave yesterday. Many flowers were placed on graves. 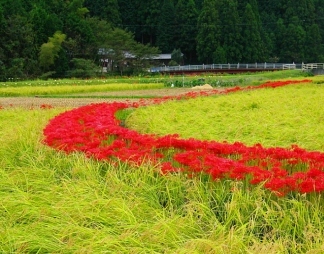 Spider lilies(彼岸花, higanbana) were blooming on the grounds of the temple. We often see the lilies growing round rice paddies and cemeteries. Spider lilies and rice paddies right before harvesting. They are said to have been planted to save people from starvation. 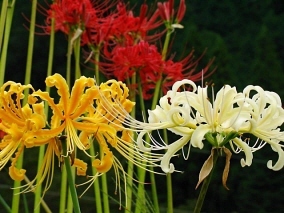 Ichishi(壱師) is thought to refers to spider lily. Kinchakuda(巾着田) is a flat land located on a sweep of the meandering Koma River(高麗川) in Saitama Prefecture. Kinchaku-da got its name from its resemblance to kinchaku, a drawstring bag. It used to be rice paddies. Now it's a place where people can relax. 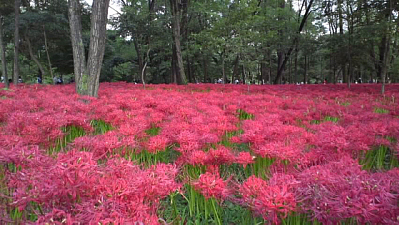 Spider lilies were found in clumps there. Immigrants from Goguryeo(高句麗) reclaimed the land in the county to cultivate rice. Goguryeo was overthrown by the Tang Dynasty of China and Silla(新羅) in 668. Both Goguryeo and Silla were ancient Korean kingdoms. Koma County(高麗郡) was created around Kinchakuda in 716 and Koma no Kokishi Jakko (高麗王若光) was appointed as the chief of the county. According to two chronicles of Japan, Jakko(若光) arrived in Japan as a member of a mission from Goguryeo in 666 and the Imperial court granted the surname of Koshiki(王) to Koma no Jakko(高麗若光) in 703. He was regarded as a member of the royal family of Goguryeo. Koma Jinja Shrine(高麗神社) was built to honor Koma no Kokishi Jakko (高麗王若光) after he died in 751. His descendants served as the head priest of this shrine generation after generation. The present head priest is the 60th generation. Shoden-in(聖天院) is the temple of the Koma family located near Koma Shrine built in 751. On the grounds of the temple, resident Korean believers built a war memorial for the Korean people with no family who died in the colonial period in 2000. The shrine and the temple give us an insight into the history between Japan and Korea.